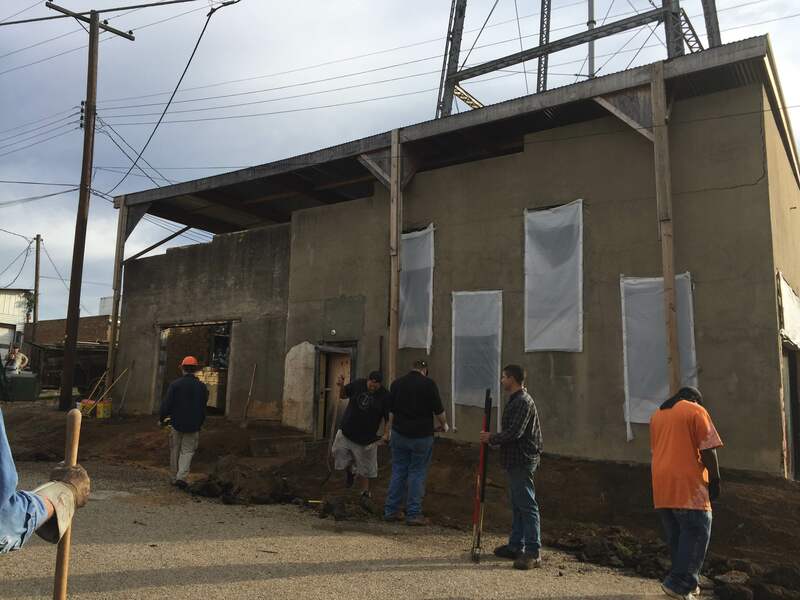 Last Saturday (November 5, 2016), over 60 volunteers assisted in an exterior and interior clean-up of the Old Linden Firehouse – a workday that attracted workers from Tucson, AZ to Richmond, VA and several other states. 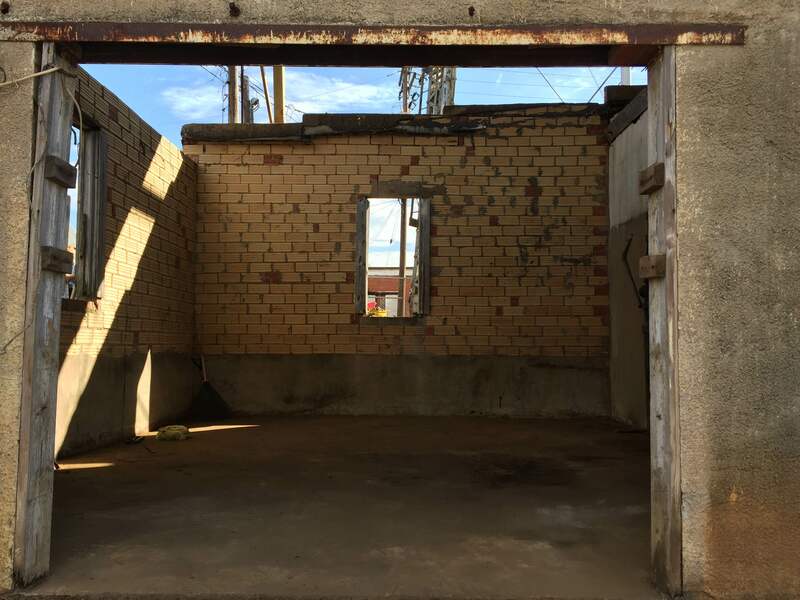 By the time the volunteers were done, the perimeter of the building was free of unwanted debris and vegetation; and many trailer loads of collapsed roofing, old asphalt, roots/stumps, and general trash had been banished from the site. The Firehouse interior was cleared of fallen roof timbers and its walls and floors swept clean. The chain link fencing along the east Firehouse wall was likewise removed, as were many vines tangled into it. Concrete and asphalt rubble was hauled away to either be recycled as City street repair material or placed in dumpsters. Finally, the footings of Linden’s Historic Water Tower, located next to the Firehouse, were exposed to reveal the original concrete pedestals; and measures were taken to prevent water from standing around the metal feet of the tower – thus extending the life of the steel structure. The Linden Heritage Foundation announced its intent to restore the 1939 Firehouse in January of 2016. The group has since been raising funds and promoting the project statewide, including a successful application to have the historic building chosen by Preservation Texas for its 2016 Texas’ Most Endangered Places list. The Cass County Probation team (more than 25 workers and essential equipment) led by Joby McDaniels, Cass County Probation Officer. Bob Swisher, Linden City Administrator, for bringing his personal heavy equipment and consulting with us on several logistical matters. John Knapp, Linden Heritage Foundation Secretary, for overseeing the trickier tasks of the day. Sandra Westbrook Skoog, Jeanie O’Rear Stevens, and Jana C. Bounds, Linden Heritage Foundation members, for donuts and serving volunteers. The Texas Historical Commission recently chose the Linden Heritage Foundation to receive a prestigious grant from the Texas Preservation Trust Fund for a Historic Structure Report – HSR for short. An HSR is a comprehensive study of the building, with professional planning recommendations for appropriate restoration work to be performed. The HSR will ensure two important things: that the restoration plan will follow national preservation standards and that the building’s eligibility to the National Register of Historic Places will be respected and preserved. The architectural firm leading the planning work, Architexas of Dallas, will soon begin inspecting the Firehouse and preparing the HSR. Meanwhile, Linden Heritage Foundation members have worked hard to prepare the historical component of the HSR, saving significantly on Architexas’ fees. The Foundation hit a home run last Saturday when the volunteer team fully prepared the site for the arrival of the architectural professionals. Let the planning work begin! I’m so proud to be able to say I was a part of this fantastic achievement and to have been able to work alongside so many hardworking folks. Great work done by all!